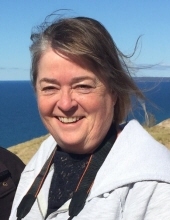 Ruth Ann Grossmeyer (Laing) - Age 63 of Fenton, previously of Linden, passed away Friday, April 5, 2019, after a short battle with cancer. Ruth was born on April 23, 1955, in Linden. She was the daughter of Ardith (Davis) Tringali and Richard Laing. Ruth was a 1973 graduate of Linden High School. She married Scott Grossmeyer on October 13, 1984, and they resided in Fenton. Together they have one daughter Katelin Wiersma. Ruth was an avid reader and lifelong learner. She enjoyed the arts and all things creative and was at her happiest when she was on vacation in a beach town where she could walk the beach, read a book next to the waves and tour small art galleries or art fairs. Although her proudest accomplishment was being the best wife and mother, she also greatly enjoyed her time working at Fenton School of Dance. She loved being around the energy of the kids and all of the creativity, and she loved the opportunity to be their resident dance mom, helping sew costumes and helping the dancers with whatever she could. Her neighborhood has always held a special place in her heart, as her neighbors were more like family. Over the years the entire Fenton community became like family to her. During her final time, the community came together and showed an unrivaled outpouring of support and kindness. She is survived by her loving husband, Scott Grossmeyer of Fenton; mother Ardith (Bert) Tringali of Sterling Heights; father Richard (Diane) Laing of Linden; daughter Katelin (Zach) Wiersma of Cedar Springs, and many beloved cousins. She was proceeded in death by her brother Robert Laing; step-father Robert Klasey; and many special aunts and uncles. A visitation will be held at Sharp Funeral Homes, Fenton Chapel, 1000 W. Silver Lake Rd, Fenton on Friday, April 19, from 4 p.m. to 8 p.m. with a memorial service being held at Fenton First Presbyterian Church, 503 S. Leroy St., Fenton on Saturday, April 20, at 11 a.m. with a luncheon at the Fenton Community Center immediately following the service. In lieu of flowers, those desiring to make a contribution may do so to the Fenton First Presbyterian Church or the Loose Senior Center in Linden Michigan. Tributes may be shared at www.sharpfuneralhomes.com. To send flowers or a remembrance gift to the family of Ruth Ann Grossmeyer, please visit our Tribute Store. "Email Address" would like to share the life celebration of Ruth Ann Grossmeyer. Click on the "link" to go to share a favorite memory or leave a condolence message for the family.